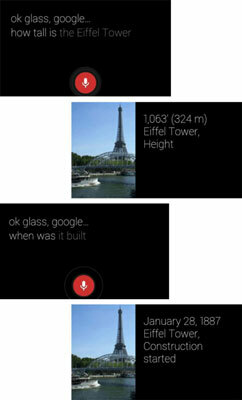 In some cases, Glass may not give you all the information you want in response to a query, but you don’t have to settle for its first answer. You can follow up on a search result in two ways: by asking a follow-up question or by viewing a website. Glass is smart enough to realize that you’re following up on your last question and that it refers to the Eiffel Tower, so it displays the screen shown, telling you that construction of the Eiffel Tower began in 1887. Sometimes, a result screen displays a URL in the bottom-left corner; this URL is a link to the website where Glass got the result information. In the figure shown, for example, a search result for a question about why the sky is blue contains a link to a website at the University of California–Riverside. To view this website, tap the touchpad and then choose View Website from the menu. 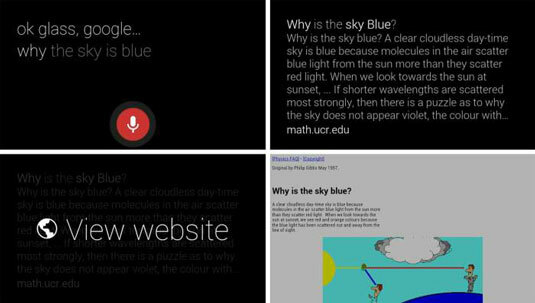 The Browser app opens, displaying more information about why the sky is blue.